The previous federal government’s decision to allow Canadian airline carriers to fly with fewer flight attendants is a threat to passenger safety. After granting exemptions to the safety-proven 1:40 ratio (one flight attendant to 40 passengers) to Air Canada mainline and rouge, Canadian North, CanJet, Sunwing, and Air Transat, Transport Canada changed the regulation itself on August 1st 2015, enabling all Canadian carriers to operate with the new 1:50 ratio (one flight attendant to 50 passenger seats). At the time, Transport Canada claimed the change would make Canada’s airlines more competitive with international carriers. But at what cost? Transport Canada’s decision puts profits ahead of passenger safety. For a long time, Canada’s airline system was one of the safest in the world. We should not be part of the competition fuelled “race to the bottom” in global aviation. The regulatory change made under the Conservatives represents a dangerous reversal in the government’s historic position. Between 2001 and 2005, both Transport Canada officials and the federal government were on the record in support of maintaining the 1:40 rule. In 2001, the Liberal government rejected an industry proposal to change the ratio. During a May 22, 2014 Transport Canada consultation meeting on the proposed regulatory change, TC officials admitted that the safety level provided by the 1:50 ratio will never be equivalent to that of the 1:40 ratio. Transport Canada also admitted that the newly-proposed regulation was not based on an up-to-date risk assessment. Historically, the House of Commons has insisted that any change to the flight attendant to passenger ratio be subject to the highest level of scrutiny, debate and oversight. Members of Parliament have repeatedly stated that regulatory changes must come before the Standing Committee on Transport. That was not the case for the 1:50 regulatory change enacted in 2015. During the last federal election campaign, CUPE’s Airline Division sent a report card to all major parties asking them, among other things, if they supported scrapping the new 1:50 regulation, and returning to the safety-proven 1:40 ratio. In the fall of 2013, Environics conducted a poll on behalf of CUPE’s Airline Division. They found that 74 per cent of Canadians believe the decision to reduce the number of flight attendants on board will have a negative impact on passenger safety. Example 2: In July 2013, Asiana Flight 214 crashed at San Francisco International Airport with 291 passengers and 12 crew on board. Four cabin crew were ejected on impact, and three were incapacitated. Only three passengers perished, including one who was struck by a ground vehicle. Under the 1:50 rule, there would have only been eight crew on Flight 214, five of whom would have been incapacitated. The loss of life and injury would likely have been much greater. In both these examples, flight attendant coverage made the crucial difference. Reducing the number of flight attendants from 1 to 40 passengers to 1 to 50 passenger seats results in some doors being left unstaffed during an emergency. This is an unacceptable and unnecessary safety risk. 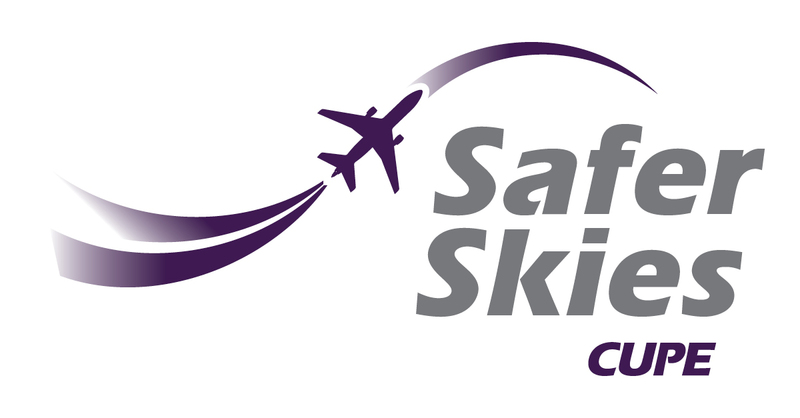 CUPE flight attendants are safety professionals. On board, they are also firefighters, police officers and nurses. Flight attendants are essential to ensure the safety and security of passengers in an emergency because every second counts. 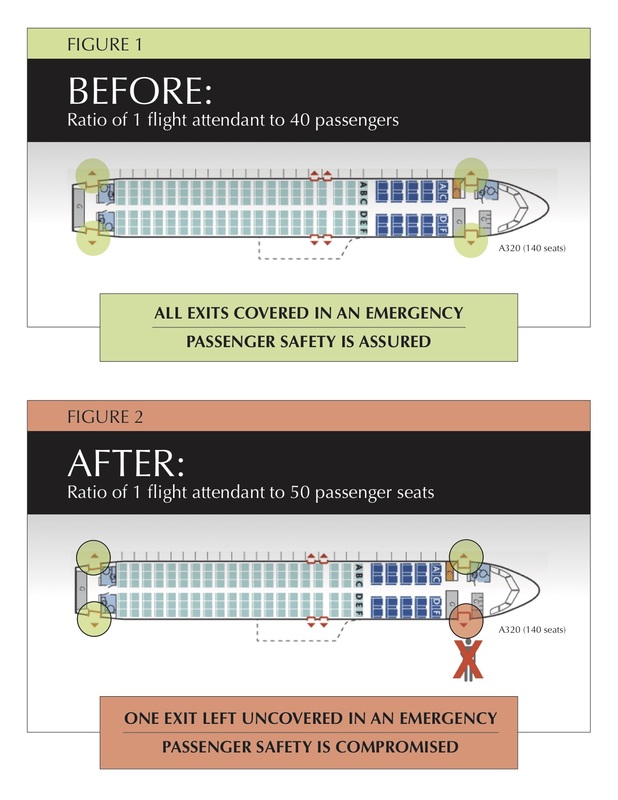 For example, in the event of a wide-bodied aircraft evacuation, not all exits are covered under the 1:50 rule (see sketch). Data from real-life emergency situations shows you need more, not fewer, flight attendants. However, evacuations are not the only risks to safety. In addition to standard safety procedures, flight attendants manage turbulence, cabin decompressions, medical emergencies, disruptive passengers, and on-board fires on a regular basis. A great many flight attendants who are flying 1:50 confirm that safety standards have decreased while stress and fatigue have increased. Despite this, Transport Canada refuses to do the kind of research that would show that flight attendant staffing levels of 1 to 40 passengers or better are needed to help save lives in real-life accidents. This is a key factor in CUPE’s decision to challenge the new regulation in Federal Court. The regulatory change has not undergone the necessary level of public scrutiny and is contrary to Transport Canada’s own previous determinations on the 1:50 staffing ratio. With such high stakes for airline passengers, the present federal government must make sure safety is the number one priority again. It is for these reasons that we ask the federal government to reverse the regulatory change and reinstate the safety-proven 1:40 ratio. It is not in the public interest for Transport Canada to maintain the status quo when the available evidence shows that the 1:50 ratio lowers passenger safety. In light of that commitment, CUPE is therefore calling for a risk assessment of the 1:50 ratio to be conducted by Transport Canada in a fully transparent way. Key stakeholders like CUPE must be involved in the process, and the risk assessment must be made available to the public. The Standing Committee on Transportation, Infrastructure and Communities (TRAN) should oversee any review of the ratio, including a new risk assessment. CUPE is Canada’s largest union with 639,000 members. We are the union for flight attendants with over 10,000 members working for Air Canada mainline and rouge, Air Transat, Calm Air, Canadian North, CanJet, Cathay Pacific, First Air and Sunwing.